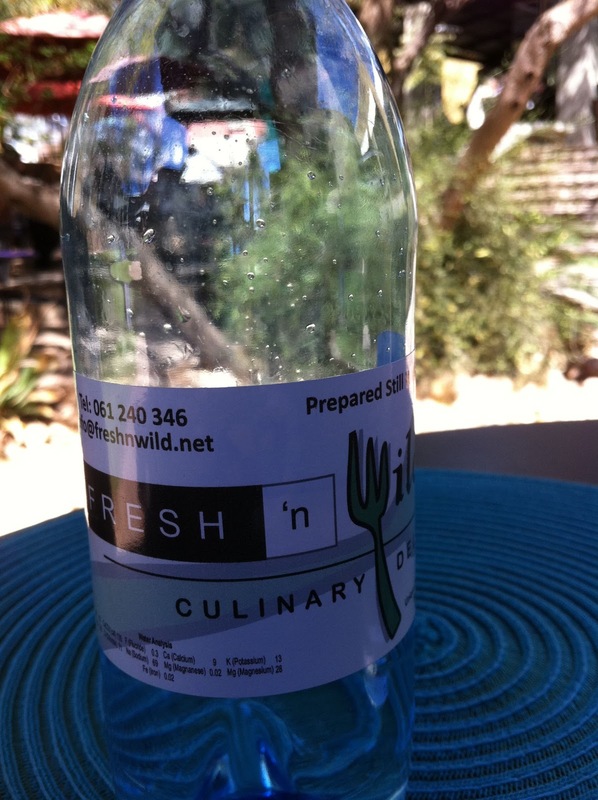 Fresh n Wild! My last visit to this delightful casual restaurant/cafe was so enjoyable that I decided to come back for more. I am pleased to report that the service is indeed consistently cheerful and efficient. And I discovered that these guys even have their own bottled water! What's even more useful, I realised that they have at least one "true" vegetarian dish on their rotating lunch menu (vegetarian may be harder to find than you realise when dining out in Africa, especially the big meat-eating countries like Namibia). However, here's a general tip for eating out in Africa: if you want a to get your food and drink quickly, the best policy is to make up your mind very quickly, and order when the waiter first comes around to take your order. If you're really really hungry, then don't let the waiter go away when he or she drops off the menus, but you really need to be quick on the ordering or they'll just walk. Not that this is the case with Fresh n Wild, though. 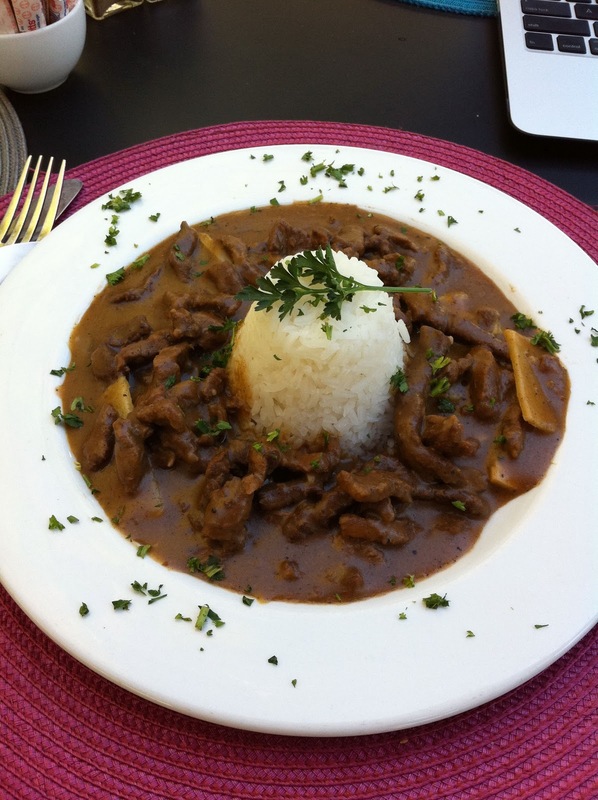 This time, I went for the beef curry. Again, nicely presented. The rice was nicely cooked (probably boiled rather than steamed, from the firmer texture of the grains). Flavours were okay, not a lot of heat in the spice. Again, not haute cuisine, but a nice filling meal nonetheless. For dessert, I opted for a pair of koeksisters. No it's not that kind of place. 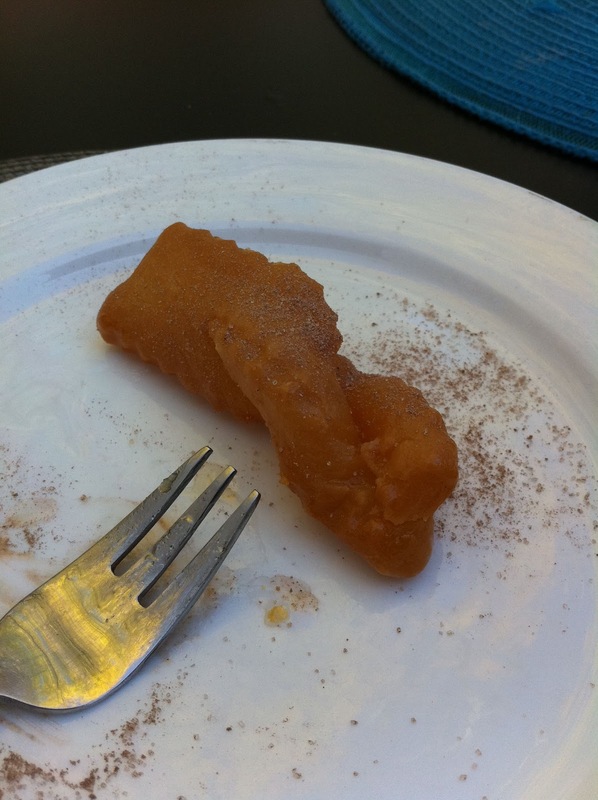 I'm talking about the delightful deep-fried braided dough, dipped in sugar syrup and served cold. I know I've said many times that I'm not big on dessert, but these little morsels were absolutely delightful. They were literally soaked through with sugar syrup - honey coloured syrup comes oozing out from the middle when you cut it in half, but rather than being too sickly sweet, they were just right. Must be the coldness, which dampens the sweetness. Definitely check it out next time you're in Windhoek. You do need a car to get there, but if you're prepared to brave a ride in one of the local shared taxis, then it'll only cost you around N$5-10, and you'll have an experience to take with you to lunch!